IN PICTURE: TERENGGANU’S DANIAL NURHAQIEM (RIGHT) IN ACTION AGAINST KELANTAN’S NIK AHMAD MUKRAM DURING THE BOYS’ UNDER-17 MATCH OF THE REDTONE KL JUNIOR OPEN AT THE NATIONAL SQUASH CENTRE IN BUKIT JALIL YESTERDAY. Chan Yiwen intends to prove the national selectors wrong when she competes in the British Junior Open squash championships in Sheffield from Jan 2-6. 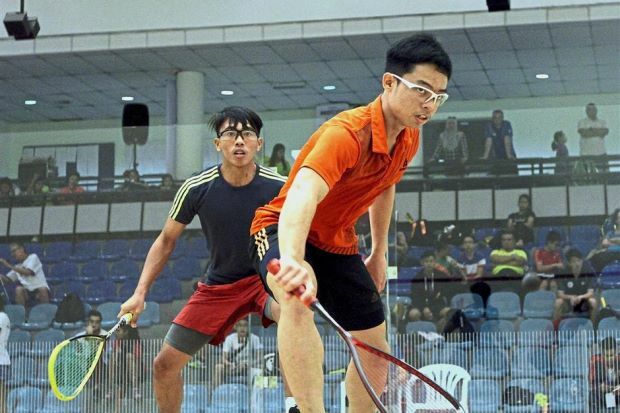 The 16-year-old, who is from Jitra, Kedah, was not selected for the British Juniors. But Yiwen, who trains under Ong Beng Hee, has been given a second chance after her parents agreed to cover her expenses to compete in Sheffield. And Yiwen, who moved to KL when she was 14, hopes to make the best of the opportunity. She has set herself two goals. The first is to make the quarter-finals of the Under-17 category in the British Juniors. “This will be my second British Juniors stint. I’m better prepared after training under Beng Hee. He’s very experienced and I’ve learned a lot from him,” said Yiwen. Her second target is to earn a spot in the national squad for the Girls’ World Junior Team Cham­pionship in New Zealand next year. For now, world No. 51 S. Sivasangari, Andrea Lee, Zoe Foo and the talented 14-year-old Aifa Azman look sure bets to make up the world junior squad. But Yiwen’s not ruling herself out, yet. “I’d love to make the world junior squad … so, a good showing at the British Juniors should help. The other girls in my age-group – (Lai) Wen Li and (Ooi) Kah Yan – are equally good,” she said. For now, Yiwen is focused on winning the Under-17 category of the Redtone KL Junior Open. The second seed, who received a first-round bye, breezed into the third round after thrashing Sarawak’s Charlize Goh 11-5, 11-2, 11-1. “The KL Juniors is a good preparation for the British Juniors. I must win it or Beng Hee will be angry with me,” said Yiwen, who faces Singapore’s Christy Ko next.